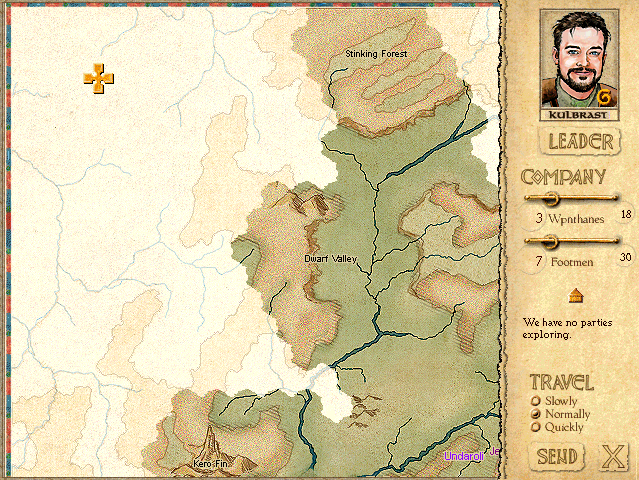 With two well-adjusted clans in the Eurmali tribe, everyone else will be clamoring to get in! 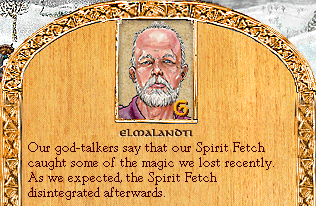 And our other spirit fetch died to reclaim the magic point we lost from attacking the dwarfs. If only there were more treasures to help reverse the effects of our bad decisions. As is traditional, we've actually made the worst use of these treasures possible - they can reclaim multiple magic points if you lose several at once, but we lost a single magic twice in a row, so our spirit fetches have been hilariously inefficient. 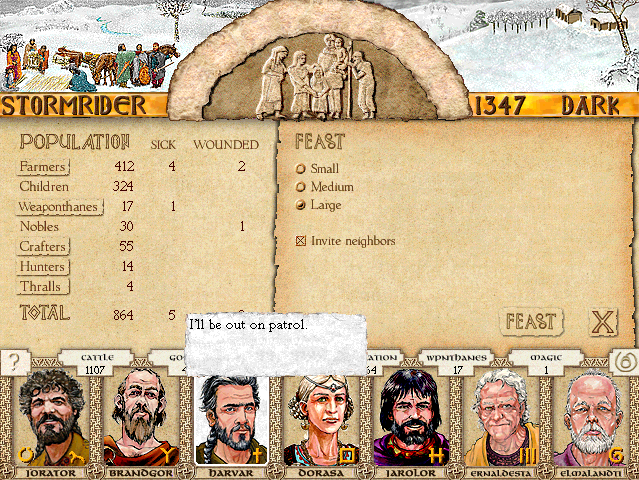 We have a shitload of food, so I hold a feast with the neighbors to make them all like us more AND to boost clan mood(remember, better clan mood means better everything). Everyone likes a feast! ...except for killjoy Harvar, who would rather be patrolling the tula for rogue snowflakes. Oops, someone's mad that they weren't invited. 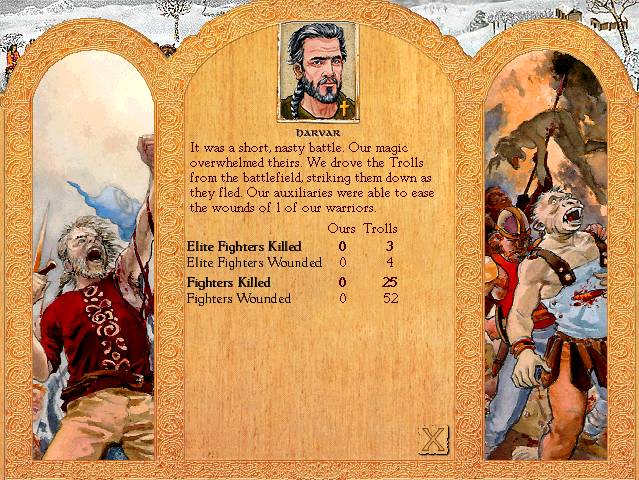 And they slipped past Harvar, so we're hopelessly outnum...scratch that, we have a pretty big force anyway. Go us! Hey! 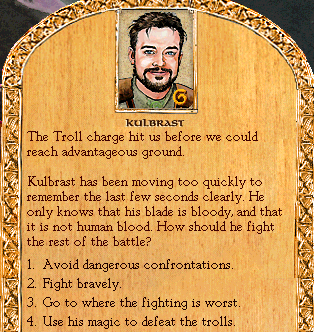 Kulbrast is being useful for once! I have nothing to say about this except . 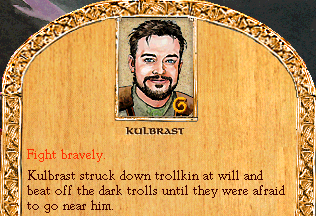 Kulbrast, continue making yourself useful! 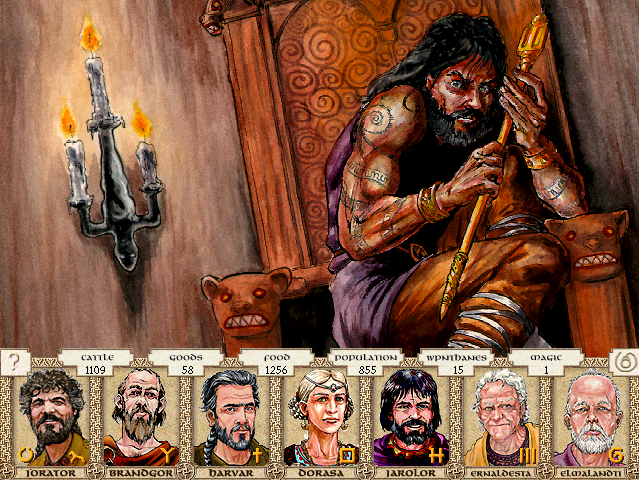 Your emissaries approach the Wolf clan, known for martial fervor, and for a history of mad chieftains. Mad-Blood Dangmag says, "How do I know this is not a trick? We Wolves are better off without a tribe, do you not think?" Completely irrelevant thing I just noticed: The name of Issaries, god of trading, talking, and diplomacy, is part of the word "emissaries." I bet the guys who named him thought they were so clever. -"Your deeds are more likely to be remembered if you are part of a tribe." -"Together, we will have protection from our foes." -"A tribe can support heroquests more easily than a clan." -"When the Wolves face hard times, the rest of the tribe can help feed you." Note: You're basically always able to select multiple options when negotiating tribes; the trick is to balance the other clan's demands with concessions they have to make. However, the Wolves are so crazy that all our options are patiently explaining to them why tribes are good. 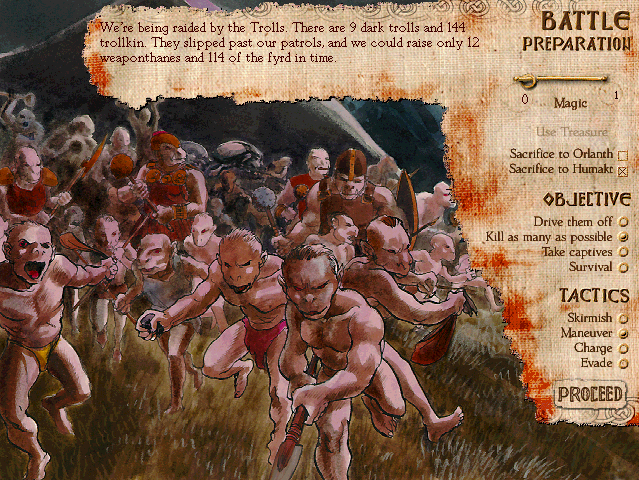 I've never gone for the "mad chieftains" clans, so I'm fascinated to see how this pans out. Their leaders may be mad, but their weaponthanes are a force to be reckoned with. Better with us than against us. It doesn't matter what arguments we use - he will accept them or reject them according to his whim of the moment. Dangmag's mother probably ate witchseed when he was nursing. The gods sometimes look after the insane.